Versioning isn’t perfect or reliable: you’d expect a patch update to a dependency, for example 1.0.1 to 1.0.2, to be unproblematic, but unless you actually try it, you won’t know until it’s too late. We found that around 15% of all minor and patch updates break their dependent code, even though semantically they shouldn’t. Greenkeeper tests every single update for you, day or night, workday or weekend, so you don’t have to. Greenkeeper has been around since 2015 and has thousands of satisfied users, including many well-known projects and companies. We’re an independent German SMB without external shareholder interests, so we’re in it for the long haul. If there are problems, the developers themselves provide competent and friendly support. A tiny in-range patch update that would have broken your build, even though it shouldn’t have! But Greenkeeper caught it right away. Need more? Using GitHub Enterprise? Want to self-host Greenkeeper? No problem: Check out Greenkeeper Enterprise. Public GitHub repos are always free, regardless of which plan you have. Choose yearly billing and get 12 months of Greenkeeper for the price of 10! If you're unhappy during the first 30 days, you'll get your money back, no questions asked. Greenkeeper only works on its own branches and doesn’t modify your code. Don’t trust any of these people? Try Greenkeeper yourself! Greenkeeper sits between npm and GitHub, observing all of the modules you depend on. When they get updated, your project gets a new branch with that update. Your CI tests kick in, and we watch them to see whether they pass. Based on the test results and your current version definitions we will open up clear, actionable pull requests or issues for you. If there’s nothing for you to do, we won’t nag you. 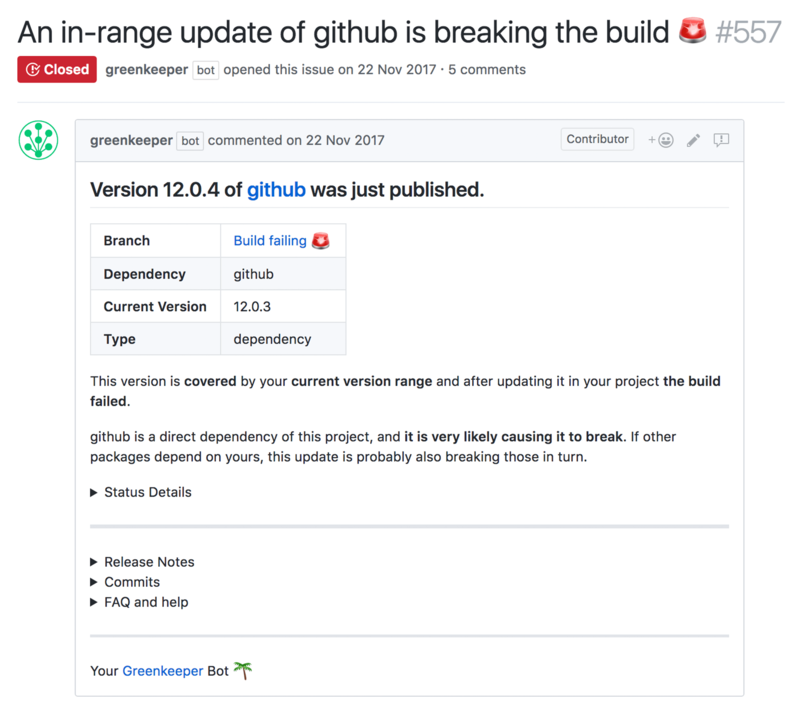 Let the friendly Greenkeeper bot take all the dull work of keeping your dependencies up to date off your shoulders and, optimally, boil it all down to a few clicks. This is as close to fully automatic as we could possibly make it. Learn more about how Greenkeeper works. Staying on top of dependency updates is a lot of cognitive overhead: your code depends on modules that depend on modules. It’s modules all the way down. Stuff gets updated all the time. It’ll either annoy you, or you’ll miss it. Greenkeeper never misses updates, and it never gets annoyed. Pin versions with one click: You’ve got stuff to do, we understand. Sometimes you simply have to make a pragmatic trade-off between fixing your build for the breaking update or just pinning the working version so you can get back to it later. Our bot can respect that. You could do all the updates and testing by hand, all the time. But that’s dull, repetitive work, which is why, let’s be honest, barely anyone actually does it. But Greenkeeper will do it, day or night, without complaining, while requiring as little of your attention as possible. Runs your CI test suite on every dependency update and only alerts developers when something needs to be done. Support for both monorepo repositories and monorepo dependencies. Full support for private packages. Built-in lockfile support for public and private packages with npm and yarn (shrinkwrap support optional). Integrates seamlessly into your existing developer workflow, with nothing new to learn. Self-hosted Greenkeeper Enterprise option for GitHub Enterprise users. Find out more about Greenkeeper Enterprise.